Re/max Field – What the Truck?! We’re sad that summer is coming to an end, but we are definitely looking to go out with a bang at Re/Max Field this Sunday! Head over to our Facebook event, RSVP and share with your friends! If you haven’t already, check out the truck lineup and all the delicious dishes they have to offer! Note: La Chula and Codfadders Seafood were previously listed in our line-up and will be unable to attend our wrap-up event. You can also download a copy of the menu and sitemap in PDF format for quick access. Site Map & Menu PDF Here! DONATE TO EDMONTON FOOD BANK! The Edmonton Food Bank will be on site collecting both food and monetary donations. A FEW FINAL TIDBITS FOR WHAT THE TRUCK?! AT RE/MAX FIELD. Transportation & Parking: There is parking available in the lots just North of the facility. Re/Max Field is also located along the #9 bus route, so stop by on your way downtown from the Fringe Festival! Public Washrooms & ATM: Public Washrooms are available and accessible. Please note that there is no ATM on site, so it’s best to prepare with cash ahead of time! What the Fork?! : We’ve heard your feedback and requests to help our events be more environmentally friendly, so one of our volunteers has organized a cutlery rental booth! Re-usable forks, knives and spoons are available for rent for a $5 deposit (which will be returned to you when you return your cutlery) to help reduce the amount of cutlery that is thrown out over the course of the event. Waste: Help our volunteers keep the site clean by putting your trash and recyclables in the appropriate bins! Entertainment: The resident DJ for our events is ElectroKinetica (Ohmera Entertainment), and he will be providing us with great music throughout the day. Lost/Found People & Property: If you find any lost people or property, please return it to the What the Truck?! Info tent (marked with our logo on the sitemap). Likewise, if you have lost something, please come visit us at the Info tent! Seating: There is plenty of seating in the outfield – we would recommend that you bring a picnic blanket along with you to sit on. Please note that you are not permitted to stake anything into the outfield. Be weather wise: Last but not least, please dress appropriately for the weather. Shades, hats, and SPF recommended! We’re ready to feed you, rain or shine! No Pets, Balls or Bats: Unfortunately, pets, bats and balls will not be allowed at this event. FIRST TIME AT A WHAT THE TRUCK?! EVENT? HAVE NO FEAR! Here are some Tips & Tricks as well as our Frequently Asked Questions. If you have any other questions while you’re at the event, you can always tweet us at @whatthetruckyeg or find one of our team members in our What the Truck?! gear (blue/yellow shirts or jackets). As always, tag us in your photos on Twitter or Instagram or use the hashtag #whatthetruck! 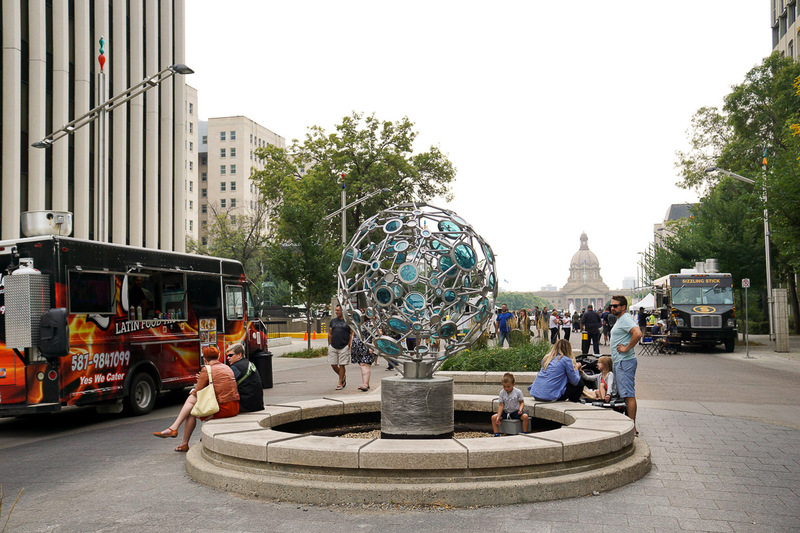 We’d love to see what you’re eating and what your favourite dishes are from all the trucks. Our 2018 Trucks in the Outfield event wouldn’t be possible without help from the staff at Re/Max Field, our volunteers and of course – you! We’re in denial just as much as anybody else, but summer is wrapping up fast and we’re heading into our last event of 2018! 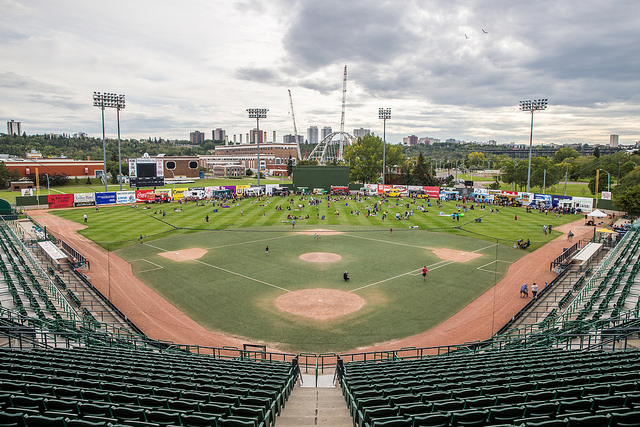 Spend a lazy Sunday afternoon with us and our trucks as we take over RE/MAX Field (formerly known as Edmonton Ballpark). We’ve lined up 14 trucks, including 4 new food trucks*, in the outfields for you. Bring your picnic gear, soak up some rays, and let’s celebrate what’s left of summer with a home run! Joining us to wrap up the season, Edmonton Food Bank will be on site to accept your non-perishable food items and monetary donations. Note: You do not have to pay admission to attend this event and free parking is available. No bats, balls, or pets allowed. Hold on to your hats, we’re working on the menus as fast as we can and they will be posted soon! For now, head over to our Facebook event to RSVP and make sure you share with your friends! Volunteer with Us at RE/MAX Field! Want a free meal & have fun with our team? We’re looking for volunteers for our August event and would love your help! Our WTT team is 100% volunteer driven and it’s thanks to you guys for making it all happen. Our volunteers help keep the venue neat and tidy, answer commonly asked questions, & make sure things run smoothly. Click here for more details on volunteering!